We’ve all been there, or at least most of us have. We find someone who causes our heart to flutter, our body to sweat, and a feeling of not being able to get enough air. Yes, it’s true. 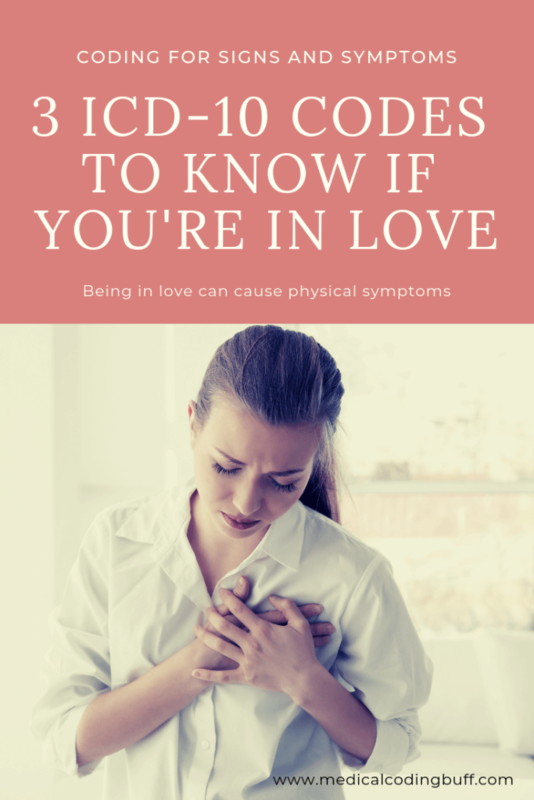 Being in love can cause physical symptoms. And it’s nothing to worry about unless these symptoms are caused by a much more serious condition like atrial fibrillation. As a medical coder, you need to know these 3 medical terms, their code descriptions, and the ICD-10-CM coding guidelines for reporting signs and symptoms. Heart palpitations (R00.2) are when you have the feeling of a fast beating heart. according to the American College of Cardiology. To find the correct code for palpitations in ICD-10, we only need to go to the Alphabetic Index to find Palpitations (heart) R00.2. This is the default code. There is also a code for psychogenic palpations (F45.8), but we cannot code for this unless it is supported by documentation. R00.2 can be confirmed in the Tabular as Palpitations, Awareness of heartbeat. Hyperventilation (R06.4) is when you have abnormally deep and rapid breathing, and this causes the amount of carbon dioxide, or CO2, in the blood to drop too low, according to the American College of Cardiology. Looking in the ICD-10-CM coding manual Index under Hyperventilation, there is the default code R06.4. There are also codes listed under Hyperventilation for hysterical, psychogenic, and syndrome. These are more specific codes, which we cannot use without supporting documentation. In the Tabular, R06.4 refers to Hyperventilation. Hyperhidrosis is when your body’s mechanism for cooling itself is overactive and you sweat excessively beyond what is needed to regulate your body temperature, according to the International Hyperhidrosis Society. There are two types of hyperhidrosis, Primary Focal (L74.510-L74.52) and Secondary Generalized (R61). These two types are based on their cause and origin. This type of excessive sweating occurs at least one episode a week, during waking hours. It does not typically occur while sleeping. The International Hyperhidrosis Society states primary focal hyperhidrosis may also affect other focal areas and may even occur in more than one area. It commonly begins in childhood and adolescence. Secondary generalized hyperhidrosis: sweating occurs on larger areas or other areas of the body and often occurs while sleeping. Secondary generalized hyperhidrosis, the rarest of the two types, usually begins in adulthood. Primary focal hyperhidrosis: a condition in itself. It is not caused by another medical condition, and it is not a side effect of a medication. It seems to be a hereditary condition that runs in families. Secondary generalized hyperhidrosis: unlike primary focal hyperhidrosis, this type is caused by another medical condition, which is why it is referred to as “secondary” hyperhidrosis. According to the ICD-10-CM coding manual, Hyperhidrosis defaults to R61 Generalized hyperhidrosis. Other specific types of hyperhidrosis are listed for focal and localized (primary) (secondary) hyperhidrosis (L74.510-L74.52). The specific type will need to be documented in the record before we can report it. Make sure you understand the meaning of Excludes1 and Excludes2 notes. The ICD-10-CM coding guidelines define an Excludes1 note as “Not coded here!” So, if an Excludes1 note is listed, the code excluded cannot be reported with the code above the exclusion note. If it’s not clear whether the two conditions are related or not, you should query the provider. An Excludes2 means “Not included here.” If an Excludes2 note is listed, it means if the condition above the exclusion note is present and also the code excluded is present, both conditions should be reported. Knowing when to code for signs and symptoms is important in medical coding. And having a good grasp of pathophysiology is also critical to this process. Many of the codes for signs and symptoms can be found in Chapter 18 of the ICD-10-CM coding manual under the heading of Symptoms, Signs, and Abnormal Clinical and Laboratory Findings, Not Elsewhere Classified (codes R00-R99). According to the 2019 ICD-10-CM Official Guidelines for Coding and Reporting, codes that describe signs and symptoms are acceptable for reporting when there is no related definitive diagnosis established (confirmed) by the provider. For example, if you are experiencing heart palpations (R00.2), are they due to being in love? Or are they caused by something else? If the documentation does not provide a confirmed diagnosis, we would need to assign a code for only the symptoms (R00.2). And there is no medical code for “love” in ICD-10-CM. But what if the palpitations are due to a more serious condition, and the documentation provides a confirmed diagnosis of paroxysmal atrial fibrillation (I48.0)? The guidelines state when a sign or symptom is routinely associated with a disease process, it should not be reported as an additional code unless the classification instructs you to report it. According to the Mayo Clinic, palpitations are routinely associated with atrial fibrillation, Therefore, according to the guideline above, there is no need to report the palpitations with the atrial fibrillation. Except, the conventions and instructions of the classification take precedence over the guidelines. There is also a note at I48.0 that states, “Excludes2: symptoms, signs and abnormal clinical and laboratory findings, not elsewhere classified (R00-R94).” Therefore, in this case, both codes (I48.0 and R00.2) should be assigned with I48.0 sequenced first. Remember, conventions and instructions take precedence over guidelines. If, however, a sign or symptom is present that is not routinely associated with a disease process, an additional code should be reported to describe it. And in order for a sign or symptom to be considered part of the disease process, the sign or symptom should be present in all or most cases for that specific disease. Otherwise, it should be reported separately. 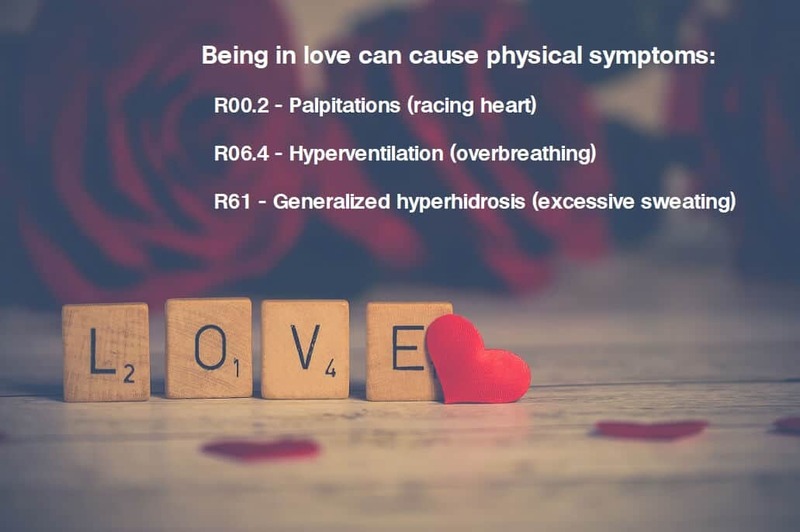 Whether or not love causes you palpitations, hyperventilation, or generalized hyperhidrosis, hopefully now you understand what these terms mean, their symptoms and causes, and how to apply the appropriate coding guidelines as it relates to signs and symptoms. And remember that conventions and instructions take priority over coding guidelines.